Wynndale Baptist Church is proud to partner each year with Samaritan's Purse to share toys and joy and the gospel with children all around the world through Operation Christmas Child. The Southeast region collected 38,646, and WBS filled 476 of those boxes! Filling each box means that children (and others that they may share their books with) will learn about Jesus. Please keep OCC in your thoughts as you shop bargains throughout the year. 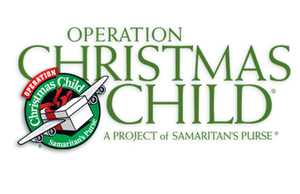 Click here for the Operation Christmas Child Website.